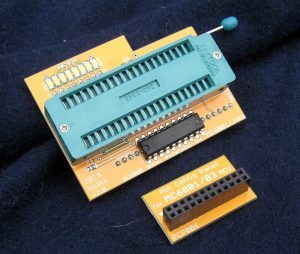 Both the Motorola MC6800 and MOS MCS6502 (which had a very similar design) have spawned many dozens of additional processors/microcontrollers that differ in pin out, features, process (CMOS/NMOS) speed, on board memory and other things, yet retain the same basic 6800 or 6502 architecture. Thus it made sense to make a single test system to handle as many of these CPU/MCU’s as possible. 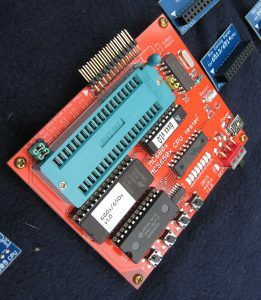 This is made possible in a way similar to the MCS-80 test systems that allowed expansions for the Z80/NSC800 and 8085. 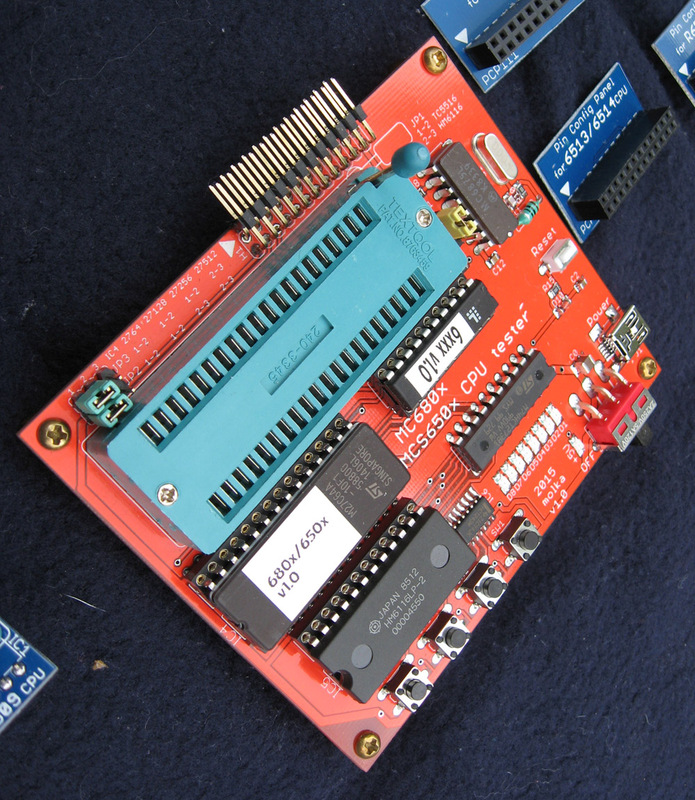 The 680x/650x board uses expansion boards, as well as a new feature called the PCP (Pin Configuration Panel). 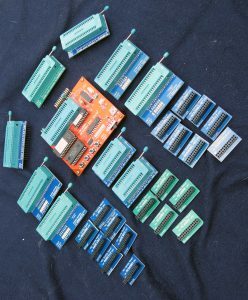 The PCP handles differences in pin-puts for the various chips to be tested and configures the base system to know which chip is being used. The expansions boards handle anything else, as well as providing LEDs for additional testing of some chips. A complete 680x/650x Test system includes the base system board, 10 PCP’s and 10 different expansions. Now included is an expansion for Motorola/Hitachi/Fujitsu and other 6801 and 6803 MCU’s as well as updated firmware to support testing these. That covers over 30 difference CPUs/MCUs on a single system. Future expansions are of course possible, with support for more Motorola MCUs such as the 6805 family in planning. • 40-pin ZIF socket – for the tested CPU – provides easy replacement of the CPUs. • Clock generator with 4MHz crystal oscillator for generating 1, 2 or 4MHz system clock of the CPU. • 2K x 8bit (HM6116/TC5516) static RAM for variable and stack area. • 8K x 8bit (D2764) EPROM holds the test programs. This program supports 4 push buttons as inputs, and 8 LEDs, as output devices. It also provides basic and special feature test routines. • 24-pin header provides facility to configure the different function pins of different CPU/MCU types. The board requires a single +5V power supply (200mA) provided through a mini-USB connector. There is a power switch and power indicator LED in the upper left corner of the test board. This covers nearly half as much as the full system, but since their are no expansions included, at a much lower cost. Obviously if you need an expansion later it can be purchased.